I ran into two issues. First, Duane’s adaptation of the recipe calls for a mass of “fresh” yeast (by which I assume is meant cake yeast, the kind commonly used by professional bakers but rarely found in the home), which she kindly gives as equivalent to a “packet” of dry yeast, but my dry yeast doesn’t come in packets, so a quantity would have been helpful. 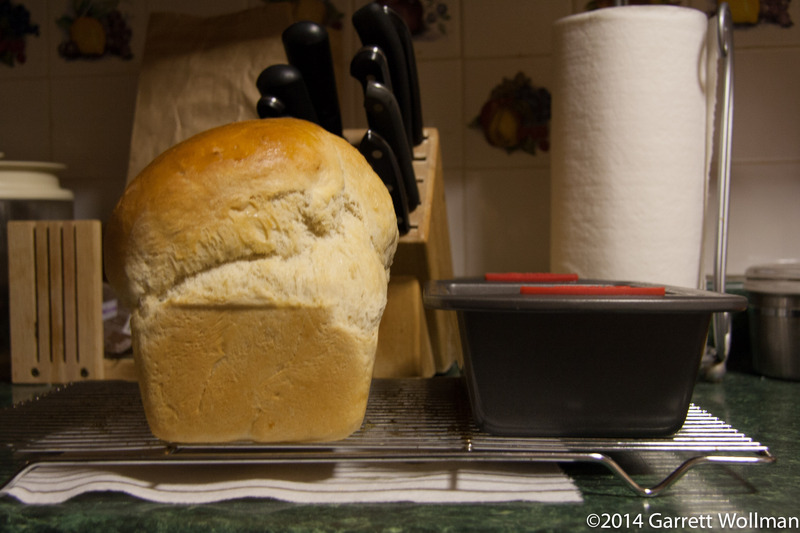 I started out trying to measure out the given mass as if it were “fresh”, but after putting nearly two tablespoons of yeast on the scale, I realized that that couldn’t possibly be right and stopped at 18 grams. 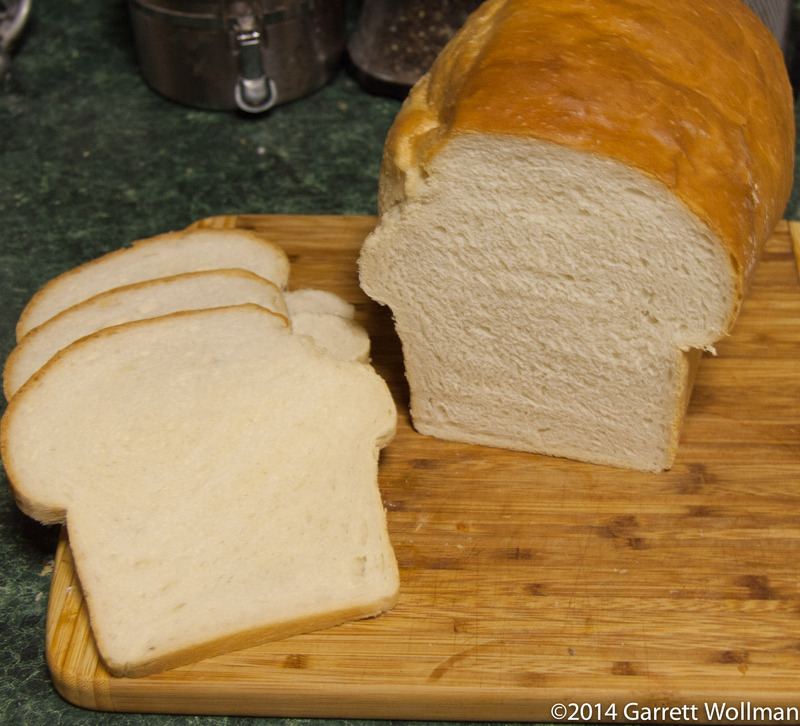 (My recipe for a whole-wheat sandwich loaf calls for only two teaspoons!) The second issue was that I misread the recipe and used only 600 grams of bread flour (King Arthur’s Sir Lancelot unbleached high-gluten flour) rather than the 660 grams called for; while the dough was quite sticky, there did not appear to be any ill effects. I departed a bit from the recipe after the first rise, choosing to use Alton Brown’s technique (from I’m Just Here for More Food ) for shaping and proofing the loaf. This involves redistributing the yeast and popping any large bubbles by flattening the dough with your knuckles, then a three-way fold (like a wallet or a business letter) repeated three times, rotating the dough between each round of folding, then pinching the ends together to avoid unseemly cracks when the dough inflates in the oven. Then I proofed the dough in a lubricated non-stick baking pan (the one seen in the photo below) for about 35 minutes, until the dough crowned the top of the pan by about half an inch — which conveniently is just enough time to preheat the oven. 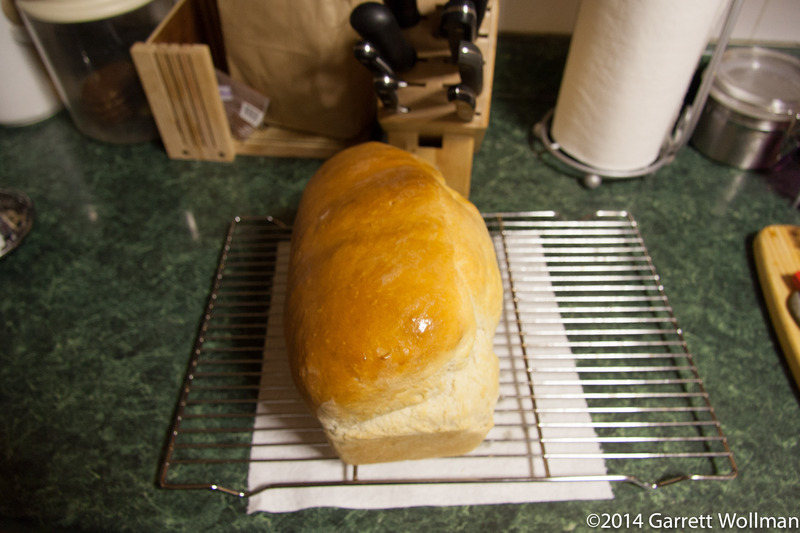 This entry was posted in Food and tagged bread, Diane Duane, recipe. Bookmark the permalink.